A junction where a woman was cut free from a car after a collision has been branded ‘dangerous’. 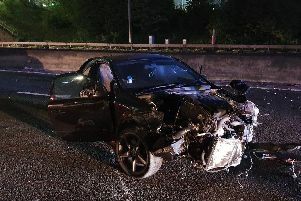 The woman ended up trapped in one of two cars involved in a smash at the junction of Prince of Wales Road and Mather Road, Darnall, at around 8.20pm yesterday. Firefighters released the woman from the mangled wreckage of one of the cars. Police officers and paramedics were also deployed to scene of the crash, which blocked the road. Today, residents have called for traffic light at the road junction, claiming there is a collision there every week. Dorne Carr, secretary of the Littledale, Bowden Wood and Halsall Tenants And Residents Association and secretary for Friends of Mather Park and Fields, said residents are calling for traffic lights at the junction to reduce collisions on the busy dual carriageway. She claims they have been campaigning for around five years and they fear it will take a death before traffic lights get the go-ahead. Mrs Carr said: “There is not a week goes by without someone being involved in a collision trying to exit the estate. “Last week it was a neighbours brother in-law in his mini bus that transports children with special needs to and from school. “Fortunately there we no children on-board, only the vehicles were damaged. She added: “One of our committee members lives opposite the junction and records most accidents, it does not incorporate the numerous daily near misses." Mrs Carr said a public meeting about the is being planned. Sheffield City Council has been approached for a comment.